Passionate home chefs and busy family cooks alike need kitchen kit that can keep up with them. 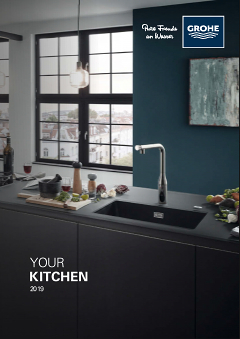 GROHE Eurocube Professional is the perfect tap for the demanding modern kitchen, with useful features and great contemporary looks. The tap features a spring-mounted professional spray head with a swivel range of 360°. For extra reach and flexibility there is also a pull-down shower head feature with fine spray and jet spray options, great for rinsing veg and cleaning up, as well as reaching across a double sink. Inside, GROHE SilkMove cartridge technology guarantees a lifetime of smooth movement and precise water and temperature control. Thanks to the Easy Installation System the tap is swift and straightforward to install. Plus the dazzling GROHE Starlight stainless steel finish is scratch-resistant for a pristine finish for years to come. The taps’ crisp, architectural styling adds an industrial edge to any modern kitchen scheme.